Disclosure: I am participating in the Chicken Farmers of Canada campaign. I received special perks in exchange for my participation in this campaign. The opinions on this blog are my own. The holidays will be here before we know it and I’m hoping that my renovations will be over by then! It’s pretty chaotic right now with our kitchen, downstairs bathroom and office completely off limits and having contractors here each day working hard to get the job done. All I can say is I can almost see the light at the end of the tunnel. Recently, I decided to surprise the workers with a home-cooked meal to show my appreciation for all their hard work. I found an easy recipe that I could prep in the morning before their arrival. 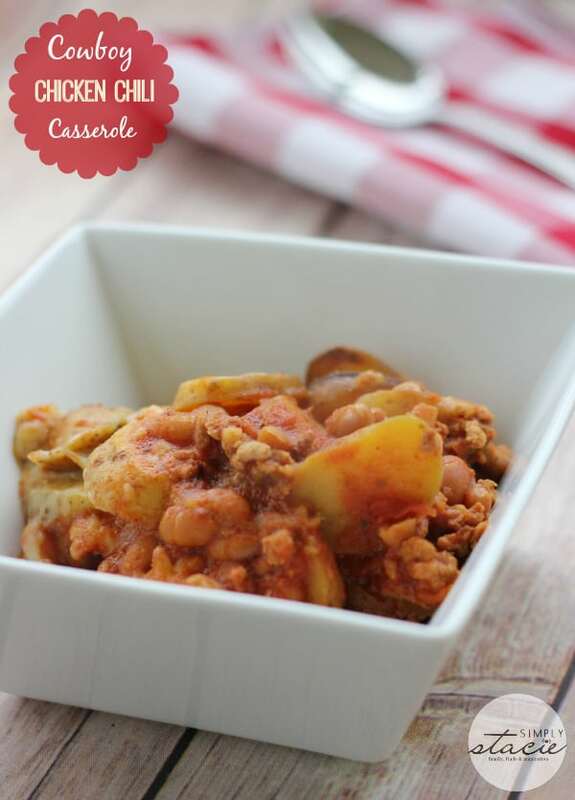 Lately I’ve been on a ground chicken kick and found a chili casserole on Chicken Farmers of Canada website. 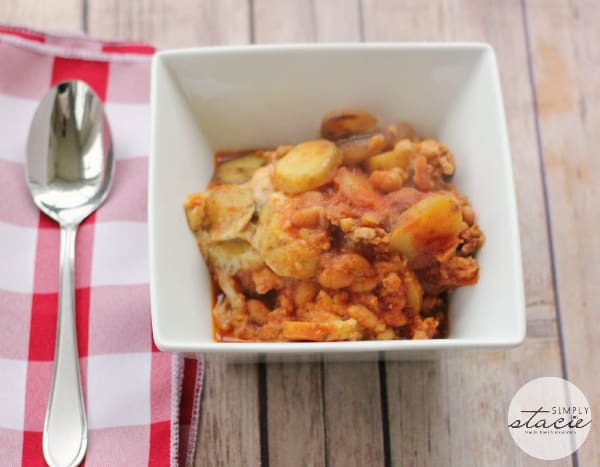 It has simple ingredients, but combined together creates comfort food perfection. It has layers of chicken chili, sliced potatoes and melted cheese. It’s hearty, filling and only mildly spicy. It’s the perfect meal to eat after working a long day! Since we needed somewhere to sit and eat, I made room in the dining room. Most of our office stuff is temporarily stored in there while it’s being completed. I’ve been so tired of living in renovations that I needed to have a sanctuary to be able to eat and entertain. 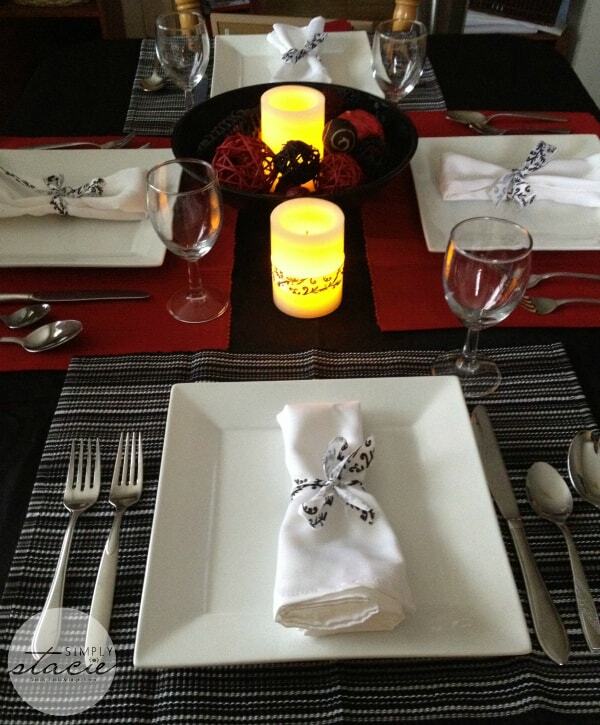 I created a table setting that I absolutely adore. 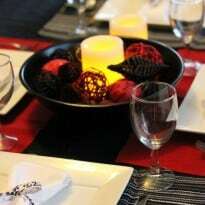 I like the modern look, but I also wanted it to suit a holiday table decoration. 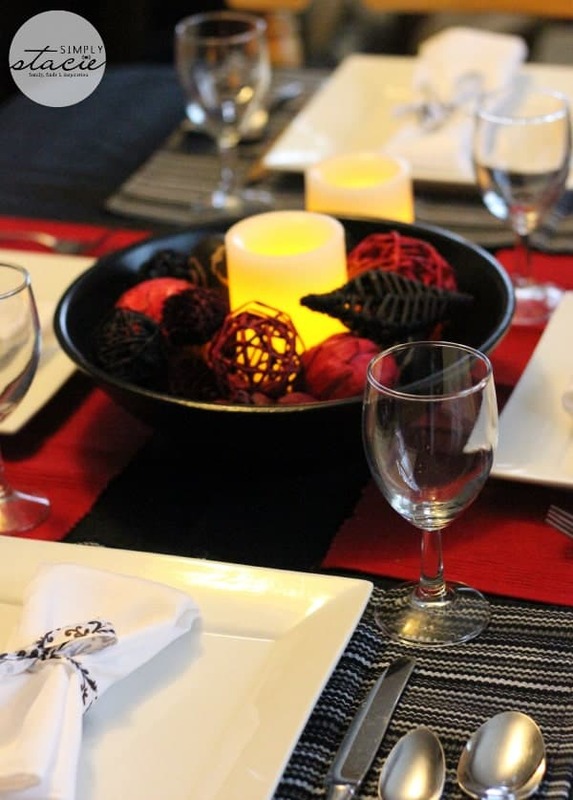 It’s not a “traditional” holiday table decoration, but it’s perfect for us to entertain our guests over the coming weeks. I found just about everything I needed at our local Walmart. 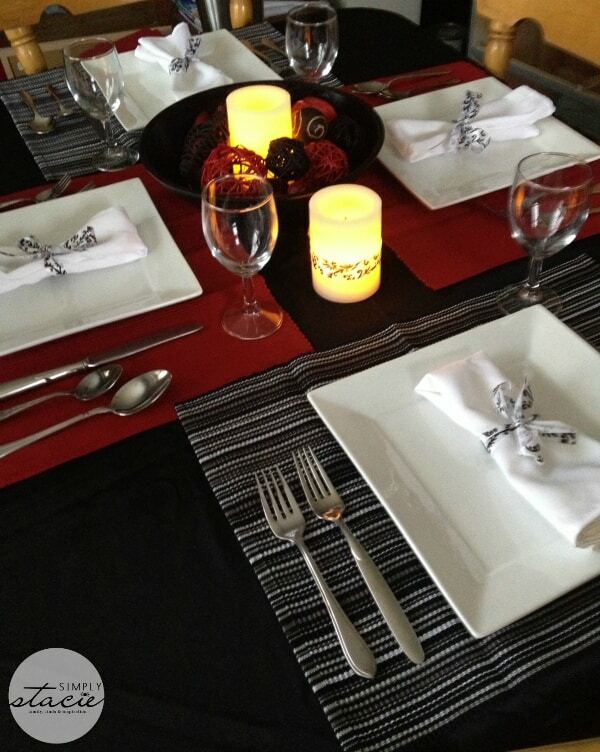 I picked up a black tablecloth for $9.99, red placemats and black/white striped placemats for $2/each. I also purchased white cloth napkins, but couldn’t find any napkin rings. John suggested picking up ribbon in the craft section and I found a gorgeous black and white patterned ribbon that was really inexpensive. I tied the ribbon around the napkins and made my own napkin rings. 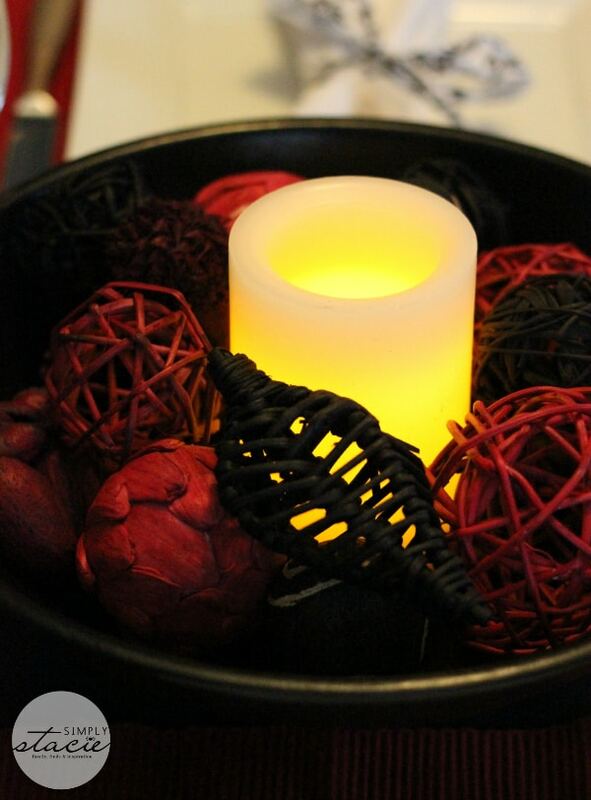 For a centrepiece, I purchased a black wooden bowl and some black and red scented potpourri. 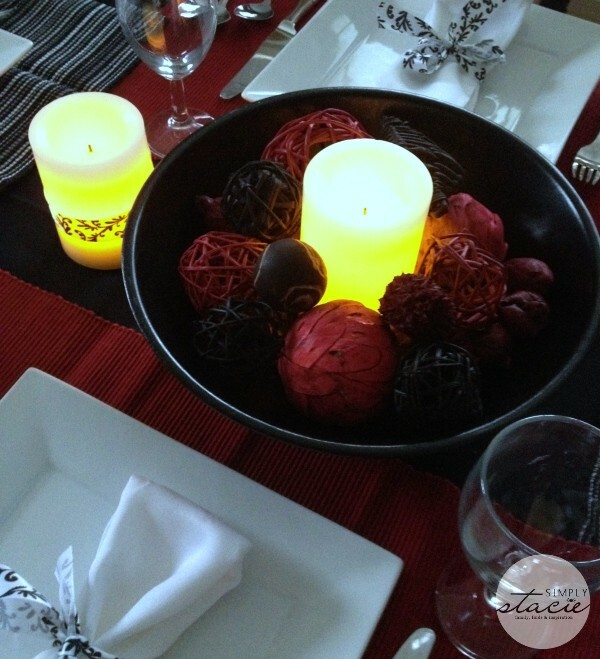 I also included some of our flameless candles to add ambiance. I put one of the candles in the centre of the bowl surrounded by the potpourri decorations. I tied a piece of ribbon around the second candle and placed it directly on the table. I may just leave my table like this because I love it so much! Who knew table decorating could be so fun? Once my kitchen is back to normal, I’m going to try some of the other recipes on the Chicken Farmers of Canada site. Right now, I’m sticking with easy ones that can be made in the slow cooker until the chaos ends. Even so, I think I created a little oasis amidst all the construction and the meal turned out very nice. Everyone was full of compliments about the meal and the decor and I was glad that I could treat them and share my thankfulness for all their help over the past couple weeks. 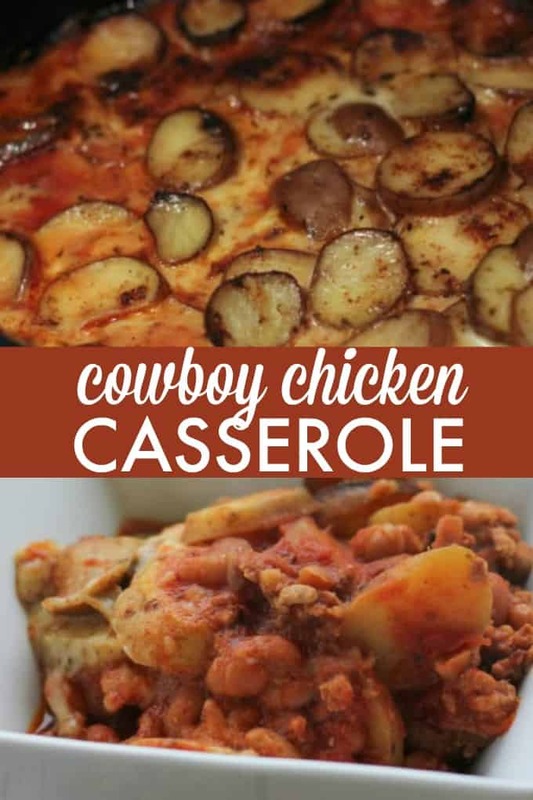 The recipe is adapted from the Cowboy Chicken Chili Casserole on the Chicken Farmers of Canada site. It was really early when I was started making it and I didn’t read the directions properly. They had three layers of chili while I only did the two. It still turned out great though and it’s a recipe that you really can’t mess up. It’s that easy and you can put your own unique twist on it. The Chicken Farmers of Canada website has a ton of delicious chicken recipes perfect for holiday entertaining. I’ve already pinned a bunch of them I plan to make. 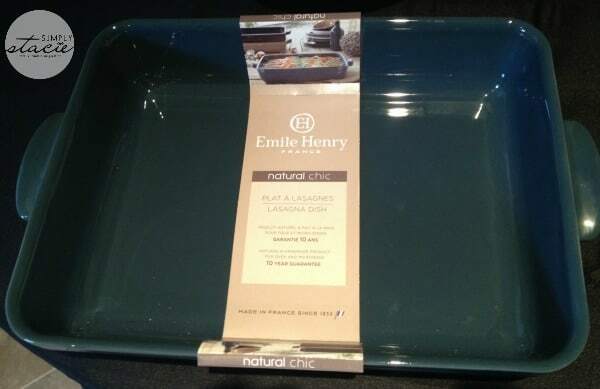 I want to use my Emile Henry Roaster to make this Whole Roasted Chicken with Sage Butter and Maple Walnut Stuffing. I’ve heard great things about their oven ceramic bakeware and tableware. I also think I found my Boxing Day recipe. Check out Chicken Farmers of Canada and find the perfect recipe for a family get-together, quiet night in or a quick, simple supper. I guarantee you’ll be hungry by the time you finish checking out all the recipes! Connect with Chicken Farmers of Canada on Facebook, Twitter and Pinterest. 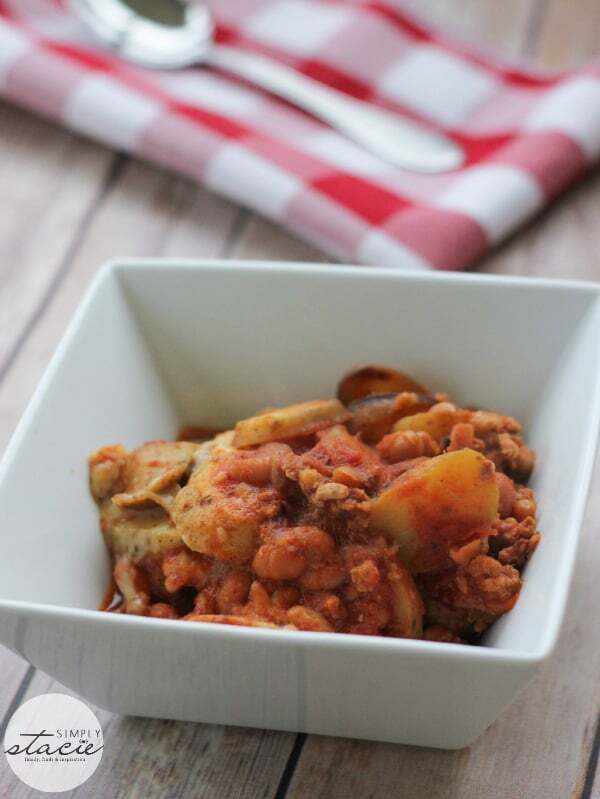 Layers of chili, beans and potatoes for a hearty meal made in the slow cooker! Heat oil over medium high heat in a large pot. Add ground chicken and break up with a spoon. Add onion powder, garlic powder, cumin, oregano and chili powder and continue to sauté for 5 minutes, stirring often or until chicken is browned. Stir in the can of beans, salsa and tomato paste. Mix well and cover. Bring to a boil, reduce heat to low and simmer for 10 minutes. Spray the inside of a slow cooker with cooking spray. To assemble, first add the chili mixture to cover the bottom of the slowcooker. Then add a layer of potatoes to cover the chili mixture. Add the rest of the chili mixture to the top of the potatoes and cover with about 1 cup of mozzarella cheese. 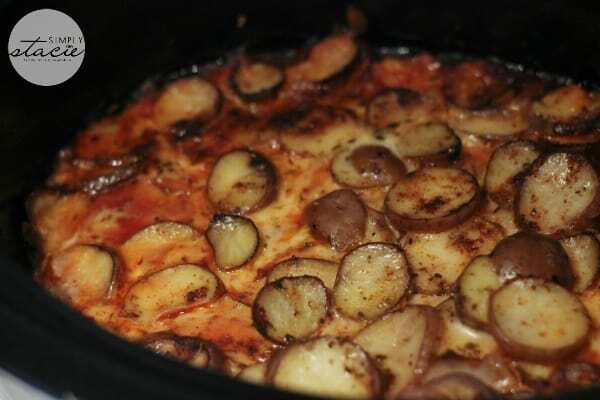 Add the rest of your sliced potatoes to the top of the cheese and add your final 1 cup of cheese to the very top. Sprinkle with oregano and chili powder. Cover and cook in slow cooker on low heat for 6 to 8 hours until the potatoes are tender and the casseroles starts to brown on top.